Nestle the nouveau crystal glass in crushed ice for a cool sip every time. City style, served on ice. Nestle the nouveau crystal glass in crushed ice for a cool sip every time. Mouth-blown, lead-free. Two glass-and-chiller sets. Dishwasher safe. Conical glass: 2-3/4"H, 4-3/4" Dia., 8-1/2 oz. I use this for my martini's while my wife uses one for keeping her wine chilled. Bottom glass for ice is quite heavy, so you wouldn't be walking around with both pieces. This is more for drinking while stationary. Also, suggest using crushed ice vs. cube. These are so cute, any beverage can be used for breakfast, lunch or dinner. Use them socially they are a true conversation piece. I really like the design and the fact that you can use it for other purposes. It's different and only people with Class and Style would buy something of this nature. They are attractive and well made but, at least for us, too difficult to hold comfortably. Love it,perfect for the perfectly chilled martini. I broke my previous glass. These are larger in circumference as well as the base which is a square shape rather than the former bowl. The square base holds home ice marker cubes and more so the glass sit's better and chills a majority of the glass from bottom to rim! Microfiber brush cleans all my bar glasses better then the former bristle type. I purchased these as a birthday gift for a martini-drinking friend. She loved them for the unique design and function keeping the martinis cold. It's great to use for a pudding to keep chill or fruits,being creative when uing this product their is no limit. 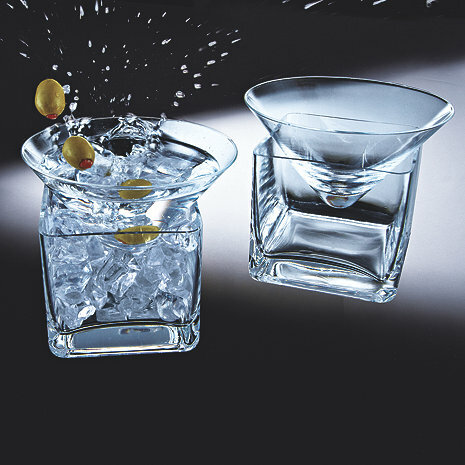 Great for showing off your martini skills, or a manhatan. It's a great choice for that evening Martini! This product can be used for shrimp cocktails also!!! It keeps the cocktails cold!! ordered one set for myself and one set as a gift. Gift was a big hit. Great conversation piece. When I gave these, and I bought 2 sets, to my girlfriend for her entertaining she flipped! How fun and unique! and it makes the drinker feel like they are on vacation! and being treated to an "experience"
I would give them again without hesitation and want a set for myself. I like martini's icy cold and this is the best way I know to keep them that way. Although they came well packaged, there were three glasses with the set but one was broken. I wasn't sure whether they came with a replacement glass or there was a replacement in the packing process without taking out the broken glass. I will never have a warm martini again. I love them and plan on giving them as gifts to my friends. Anyone who is a martini drinker will love them. It's a fun martini glass. However, it is difficult to carry and the cubed ice container needs to be deeper. Overall, still glad I bought. I didn't open these right away and later found that one was chipped on the lip. Pretty disappointing but they are still pretty great. watermellon martinis looke amazing in this! Try freezing a bit of mellon rind in the ice! Very nice martini chillers. Unique design. Best if used while sitting at a table or bar. A bit awkward if trying to use while standing up without a place to rest the botton while you use the top. Best if used with crushed ice to balance the top. Hi! Thought the products would be great - but they never arrived. Didn't catch it until Christmas Day. Checkin gin on Monday the 28th. I use these at formal dinners for the appetizer. They sparkle and shine when filled with ice and food.